What a few weeks it has been, I’m still uncertain what day of the week it is. Days seem to merge into one long experience of getting some sleep, being awakened during the night and trying to fit in some amount of work in as well. Would I change anything? Absolutely not, it may seem contrived but I have loved every single minute of it! It all started on Wednesday 20th February the day we had set in stone some time ago to do our ProductHunt launch. 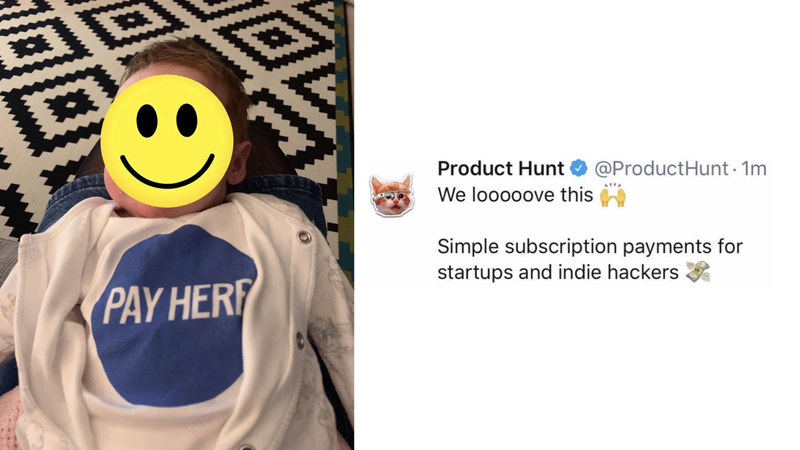 Lee Munroe had very kindly agreed to be the Hunter for payhere and it went live at around 8.30am GMT what a buzz to see it finally, after our preparation, on the homepage of ProductHunt. Initially my co-founder and creator of payhere, Pete, and I had set a list out of people that we were each to reach out to for support. Off we went to work, but then my wife, Phillippa, informed me that she thought it would be a good time to go to the hospital as the baby was on the way. Wow, off with my phone charger and everything else in tow, we headed towards the hospital. Already that morning payhere had got great traction with upvotes from our friends and colleagues. A massive mention for all the teams in our cohort at Ignite Propel, who all went above and beyond to help us have a successful launch. From tweeting, to posting, to messages of support our Ignite family were incredible! The next few hours Pete was reaching out to most of the developers on planet earth for feedback on payhere and if they could offer support in any way–it certainly seemed to work. I do need to point out that yes I was on my phone while my wife was in the hospital bed, but, she was very happy that I was distracted from annoying her with my usual “do you have coins for the vending machine” or “what do you think that device does”. It was around lunch time onwards that things started really heating up we were being hit from every direction possible by questions from potential users. LinkedIn, Twitter, ProductHunt itself, Instagram and email inboxes were filling up fast. We had setup Intercom on our site, I would recommend it to anyone as it is such a useful tool for customer interaction. Pete was in between answering technical questions on Intercom and at the same time being told off by Twitter for the amount of DMs he had sent that day. Payhere started climbing up the Product Hunt ladder and stayed around the 5/6 position. Later in the afternoon another product started gaining on us quite quickly, it was at that stage that Pete published an article titled “Live: we’re about to lose our top 5 spot on product hunt.” That certainly seem to have a rallying call, we immediately started seeing more UpVotes appear. At this stage I had been in the hospital for 12 hours, well not technically true I did sneak out for a Five Guys burger, it was vitally important that I kept my energy levels up. Well thats what I told Phillippa, my wife, which worked. It was around 11pm that I was sent home as it was put “no show would be happening tonight”. Fast forward 2 hours into a deep sleep when I was woken up to be informed I needed to head to the hospital (20 minutes away) as fast as I could. I do have to say how fantastic it is to be driving down a motorway at 2am with no one about, sticking to the speed limit of course and Tom Petty playing extremely loud in my car. It was glorious. Once I arrived it did give me a good opportunity to start hitting up people in the west coast USA for support (again I was told by my wife to stay out of the way and not annoy her), we got some more support but all the products started to slow at this stage. As the hours blurred together soon the Product Hunt day was over and there was a new selection of products about to go through the same process. I do have to say that if anyone is thinking about launching on Product Hunt it is definitely worthwhile, we were able to get in front of many potential users that would have been extremely hard without PH. She had never heard of Product Hunt. Pia prefers the after party. Arriving fashionably late is a must.